Live on Thursday, June 5 at 9:30am PDT. Will be coming to fruition in a couple of days....what is it? Garage Sale Blog Network: An eclectic mix of old lamps, shiny vinyl, 1973 stamps coming at you in humanistic form. This is a blog of 13 people, 13 strands of life, 13 very different ways of looking at the world. I've always had a fascination for Scooby Doo. I mean talking dogs are great of course but talking dogs solving mysteries with their best friends? I mean you can't beat that. 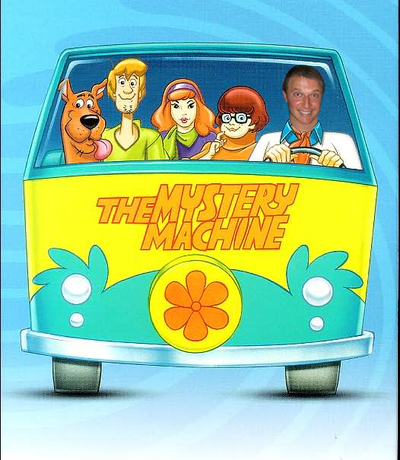 I'm serious....Perhaps not today but very soon I will buy a $500 van much like that seen in Scooby Doo cartoons and I will solve mysteries with 4-5 of my best friends for a summer. We might even start with riddles to build some street credibility and go from there. I'm thinking upper US states like North Dakota need some mysterey solving.